2018 was another year when we demonstrated that we are not only fulfilling a need but leading the change toward a sustainable city. We have become the go-to place for people of all ages and backgrounds who love to fix things, and people who need things fixed and want to learn how to do it themselves. In 2019, we plan to enhance our apprenticeship program and the collection of repair data. We will be launching our new logo design. And we will be moving forward with the development of our home base, which for the moment we are calling, “The Repair Centre”. We see the centre as a magnet for anything to do with the repairing of household items, with education and research around repairing, and with the sharing and advancing of practical knowledge. There will be spaces designed for the repairs of different types of household items with tools available for use. Our monthly events will be held in a space specially designed for our community of fixers and volunteers. There will be 3D printing machines to create spare parts for repair. There will be a Global Classroom with high definition video conferencing technology that connects us with repair and sustainability initiatives around the world. We will continue to provide outreach community events in different parts of the city, but there will now be a home for us, a place not just for people in the city who love to fix things and want to learn about fixing and sustainability, but a hub for people around the world to work together on repair. We are living in a world of rising population and ever-increasing consumption. The traditional 3Rs (reduce, reuse and recycle) approach has not been able to effectively keep waste out of landfills. We need fundamental change in our attitude towards our “stuff”. We need to move away from a disposable society, build a culture where everyone values what they have and tries to minimize consumption as much as possible. It is important to teach our next generation repair skills. These are vital skills not just for personal wellbeing but society’s wellbeing too, as basic as cooking and reading. This is our future. We are building a world where waste is seen as the resource it is, something to be fixed, reused, repurposed, given new life, sustained in a circular economy that wastes nothing. We are looking for new volunteers to join us. If you would like to support us as a fixer, an apprentice fixer, a general volunteer, a photographer, an event organizer, or in whatever way you would like to contribute, we would love to hear from you! 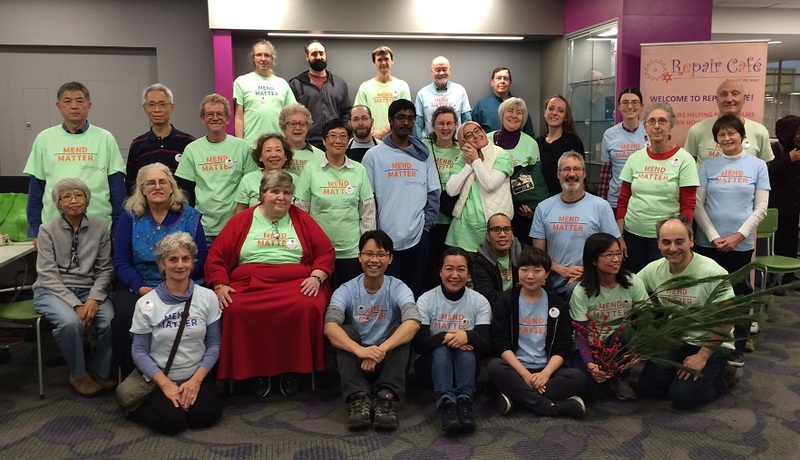 To learn about how to get to get involved, please visit the Volunteer page. 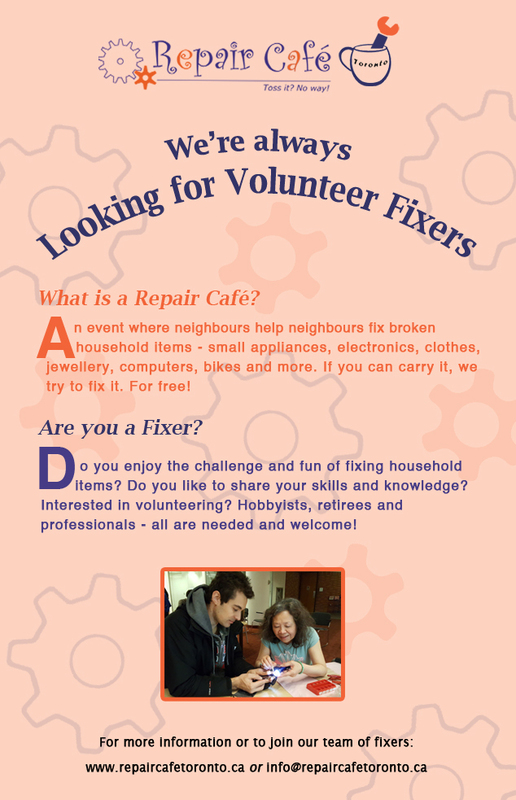 For any question, you can email us at info@repaircafetoronto.ca. If you need help with fixing your broken household item, feel free to bring it on! See you at our upcoming event at Toronto Reference Library on Saturday, January 19!